The 2018 NFL Draft is stocked with talent. From quarterbacks to wide receivers and defensive ends to secondary, there’s no denying we will be witnessing future stars in this year’s draft. 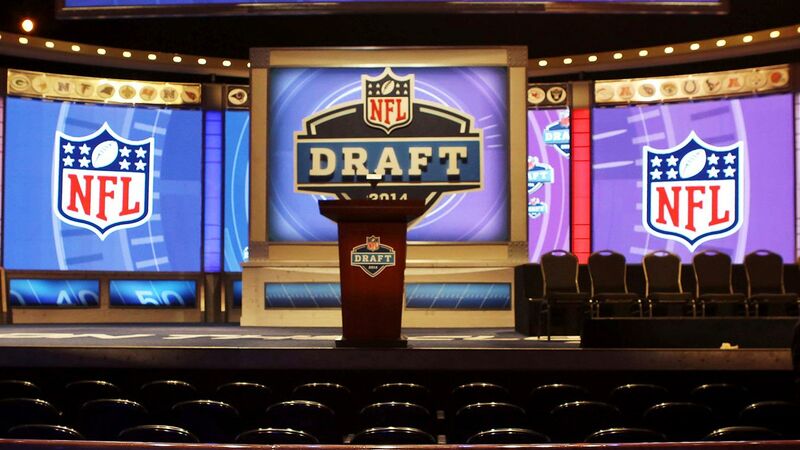 But until the actual draft, let’s have some fun and make some predictions that probably won’t even happen. There isn’t much left to say about Barkley that hasn’t already been said. Barkley is undoubtedly the most well rounded offensive talent in this year’s draft. While the Browns have their play maker Josh Gordon officially back, drafting Barkley will quickly make their offense much better. 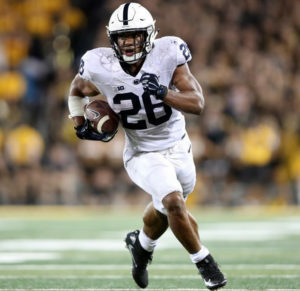 Barkley has put up three straight 1,000+ yard seasons and has rushed for 18 touchdowns each of the past two years. 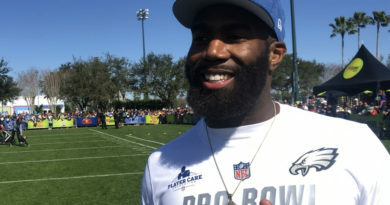 The dynamic runningback showcased his receiving ability setting a career high in receptions (54), receiving yards (632), and yards from scrimmage (1,903). Honestly, it would be such a typical Browns move if they don’t take Barkley. If they don’t then the Giants front office will be going nuts. 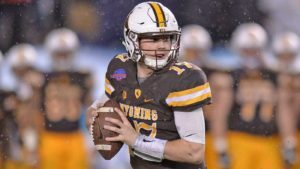 Rosen even spoke out earlier this off-season that he basically wants no part of the Cleveland Browns and that he much rather be part of the Giants organization. With Eli Manning’s career coming to a near end, the Giants should definitely be looking for their future successor. Rosen threw for 3,756 yards this past season with 26 touchdowns, ten interceptions, and a 62.6% completion percentage. I would say his 6’4 height is also appealing but outside of Baker Mayfield almost every first-round talent quarterback is around the same height. Rosen’s scouting report is a different case depending which website you go to. Some have him as the draft’s top quarterback and others don’t. Fans should know how these things go. But I do find it coincidental how Rosen is complaining about a team drafting him just as Manning did when he was drafted. Maybe Rosen is the perfect fit for the Giants in that case. Honestly, this pick is a complete toss up. Chubb is arguably the most polished defensive lineman in the entire draft. The Colts have so many problems on both sides of the ball so they really can’t go wrong with who they choose with this pick. 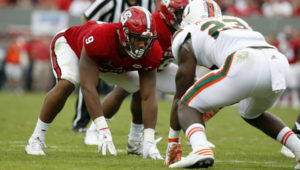 But the Colts defense was 31st in the league in sacks so Chubb would be a great addition for the Colts. Chubb won ACC Defensive Player of the Year this past season after wracking up 73 total tackles (23 of them for loss) and ten sacks. In 2016 Chubb posted similar stats with 56 total tackles (21 of them for loss) and, again, ten sacks. And at 6’4 275 lbs Chubb is an absolute beast. A trade back option could definitely be a possibility to acquire more picks and gain more young talent but Chubb is undoubtedly a top-5 pick. You know the bar was set low for the Jets this past season when I say they were actually a surprise team. Everyone thought the Jets wouldn't win a single game yet ended up winning five with some very close losses. One thing for sure is that the Jets need to find themselves a franchise quarterback. 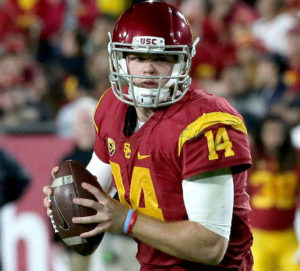 And while most fans will argue that Sam Darnold really didn't impress them this past season for USC, NFL scouts still seem to love the kid's play. Darnold still managed to throw for 4,143 yards with 26 touchdowns and 13 interceptions. He ended the season with an impressive 148.1 passer rating. This pick could end up being very crucial to the future of the Jets. But lets be honest, no matter who the Jets pick their fans will probably boo the poor kid. The Broncos are looking for a Quarterback in the upcoming draft. But Allen going this high is very questionable even though scouts seem to adore him. This past season he threw for just 1,812 yards compared to 2016 - which he threw for 3,203 yards. His passer rating was also down from 144.9 to a 127.8. His 56% completion percentage is also a cause for concern. Although, Allen didn't have the talent around him like Sam Darnold, Baker Mayfield, Lamar Jackson or Josh Rosen did. Denver is a good fit for Allen because he won't have to carry the load like someone who would be going to Cleveland. The Broncos had the third ranked defense this past season and still possess offensive weapons like C.J. Anderson, Demarius Thomas and Emmanuel Sanders. Having experience in cold weather is also a plus for Allen and the Broncos. The Browns not taking a quarterback with either of their first two overall picks? Hey, it's a mock draft. It's for fun. And like every other draft "analyst" I'm more than likely going to be wrong with this one. So let's have fun and switch it up a bit. Fitzpatrick could easily be the best defensive back in the entire draft. Despite failing to possess true top end speed, Fitzpatrick has an eye for the ball. 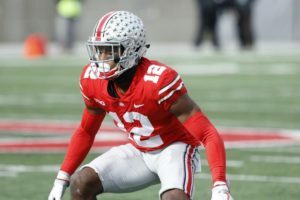 While he had a down year this past season statistically, in 2016 Fitzpatrick was in a four-way tie for third most interceptions (6) in the nation. Fitzpatrick being 6'1 would also make him the tallest starting defender in the Browns secondary. This pick isn't that far fetched in the sense they do need a safety to pair along with Jabrill Peppers. The one downside to drafting Key is his durability. His 2017 season was cut in half after having shoulder surgery - so that could be worrisome. Plus, Key's abscense in the spring of last year due to personal reasons may also be a cause for concern. But when he's on the field, Key is a force. The edge rusher managed to get 12 sacks in the 2016 season which put him in the nation's top 10 pass rushers. Key is also a physical specimen. He's got an inch on J.J. Watt with the same weight as Demarcus Lawrence - who was second in the league in sacks last year. The Bucs defense ranked dead last in total sacks this past season so a giant speed rusher like Key is a perfect pick. The Bears wide receiving core ... Well, they didn't have one this past season. And despite having one of the league's best runningback duo's in Howard and Cohen, Bears quarterback Mitch Trubisky didn't have a wideout who he could constantly rely on. 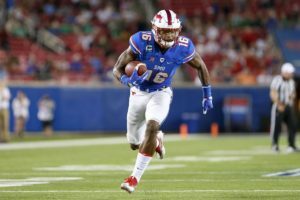 Sutton is rated the number one receiver across many draft boards for this year's draft and with good reason. 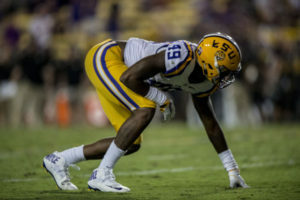 The 6'4 wideout's athleticism is extremely hard to pass up and his overall ability would undoubtedly make him the number one receiver for the Bears. Sutton has posted back-to-back 1,000 yard seasons (2016-2017) with over ten touchdowns in each. Even in his freshman year Sutton managed to post 862 yards with nine touchdowns. Trubisky threw just seven touchdowns in 12 games so drafting Sutton would be ideal for the Bears if they want to finally have a red-zone threat. Not a single guard was taken in the first-round of the 2017 draft. Usually, interior linemen fall to the back-end of the first round since tackles are the more valuable position to most teams. But Nelson's point of attack abilities make him a top 15 talent and this draft's highest rated guard. The 49ers gave up the 10th most sacks last season and there interior line was ranked 18th in the league. With Garoppolo set to become their franchise quarterback getting him a stellar offensive line would be ideal. But who knows. The 49ers also need a number one target for Garoppolo so they could choose a wide receiver with this pick which would be understandable. But Nelson's blocking abilities will be severely hard to pass up at the ninth spot. And you know what they say, "The game is won within the trenches." The Raiders finished 23rd in the league in total defense this past season. Whether they go for secondary or front seven they need defense. Period. 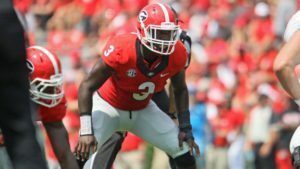 Smith may possibly be the most polished linebacker in the entire draft and his tenacity mirrors Khalil Mack's. 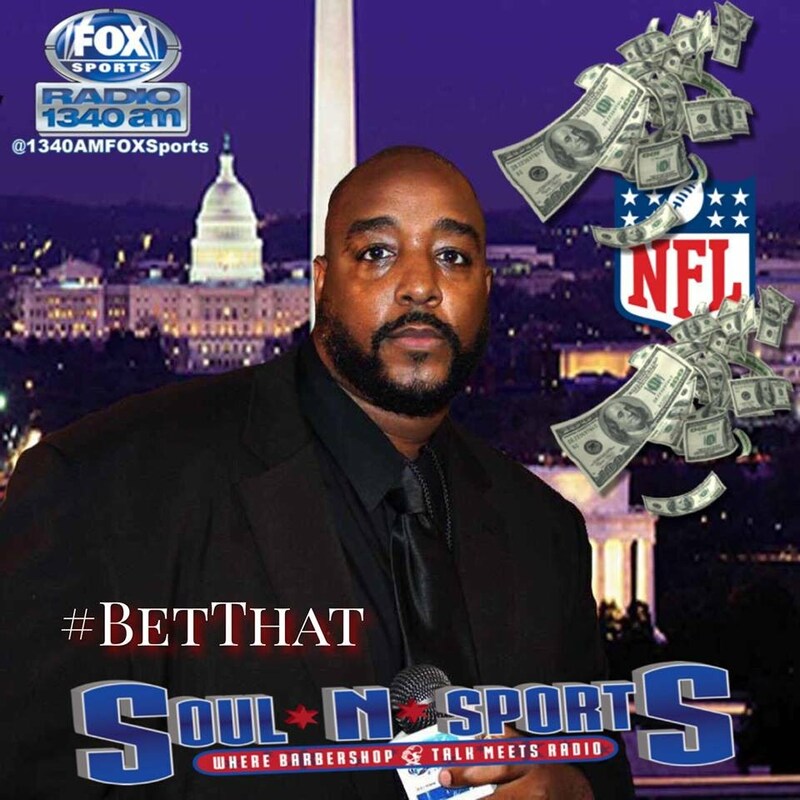 Smith had 85 solo tackles (137 combined), 14 tackles for loss, and 6.5 sacks this past season. Having Smith and Mack in the same front seven could be the start of something ferocious for the Raiders. I'd be very surprised if the Raiders go offense with this pick, and so would everyone else. Wait a minute... We are talking about the Raiders here. 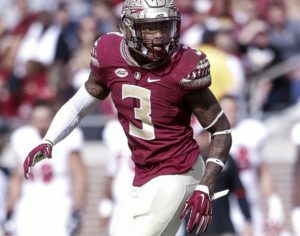 Derwin James is a high-risk/high-reward type of player after missing most of the 2016 season with season-ending knee surgery. But James is a big-bodied safety standing at 6'3 211 lbs with great speed and pursuit abilities. 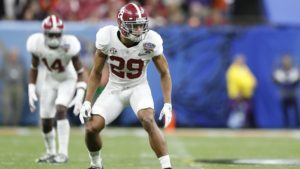 According to scouting reports across sports media, James is arguably the best safety in the draft along with Minkah Fitzpatrick out of Alabama. So getting James at the 11th spot is not a bad pick by any means for a Dolphins pass defense that ranked 16th in the league. But with Rashad Jones and T.J. McDonald still under contract, this pick may be a head-scratcher. And let's be honest, in every single first round of every single NFL draft there will always be at least one team that'll make you scratch your head and say, "Why did they pick him?" Williams has all the right things going for him as an offensive tackle. 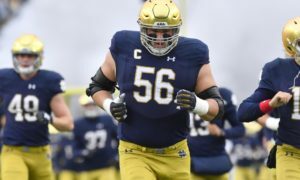 He's got the prime physical attributes you'd want in an offensive tackle at 6'6 315 lbs. 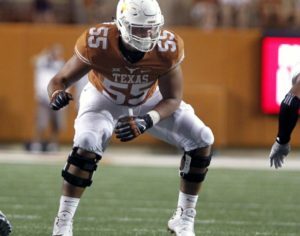 And he became the Texas Longhorns top blocker after the 2016 season in which he gave up just one sack and three quarterback hurries on 956 snaps. That's pretty impressive. And while Williams is projected a mid-first round pick, the Bengals would be idiotic to not draft him after having the 20th ranked pass protection last season. Also, something to note is Right Tackle Eric Winston is an unrestricted free agent this off-season. The Bengals have the 13th most cap space this off-season so if they do decide to sign a tackle then this pick may be pointless and we just both wasted our time reading up on this pick. Oh, were you expecting me to say the next quarterback? Well, if the Redskins didn't rank dead last in run defense this past season perhaps I would have done so. 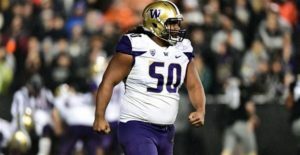 Vita Vea is arguably the strongest prospect in the entire draft. Yes, that means offensive and defensive players. The 6'5 340 lbs ferocious bull rusher , and run stuffer might I add, could be a great replacement after possibly losing both Arthur Jones and Phil Taylor to free agency. Some would say, "But what about Ziggy Hood?" Let me put it this way, if he was third on the depth chart behind Jones and Taylor then Hood isn't starter material. Oh, Redskins fans will love this about Vea... HE'S HEALTHY! Packers had the 23rd ranked passing defense last season. Their two starting cornerbacks were Davon House and Damarious Randall, not the most household names unless you watch NFC North football. Neither cornerback is in the league's top 50 cornerbacks and the Packers need to find their number one cornerback. With Ward being the number one corner on an Ohio State team that ranked 17th in the nation in pass defense he could end up being their guy. Despite being 5'10, Ward's physical capabilities overshadow his height - usually taking on opposing team's number one receivers. Whether it's Ward or some other defensive player in general, the Packers can't keep relying on offense... My bad, I meant Aaron Rodgers. 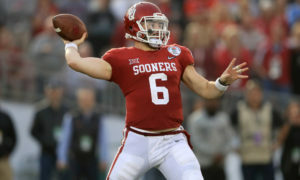 I got Mayfield going to Arizona on the count of that the Redskins sign back Cousins and the teams earlier are more paranoid about his attitude and less concerned about taking the most pro-ready quarterback in the draft. Palmer is gone and this team desperately needs a quarterback. And who better to lead a Cardinals offense with weapons like David Johnson and Larry Fitzgerald to support you? That reminds me, Larry Fitzgerald could be a great mentor and help keep Mayfield in place. Remember how everyone thought Tyrann Mathieu was going to be a problem? Now he's one of the best safeties in football. Not to mention the weather aspect and how Mayfield played in mostly warm environments. And being in the NFC South he'd be playing in warm environments throughout most of the year.